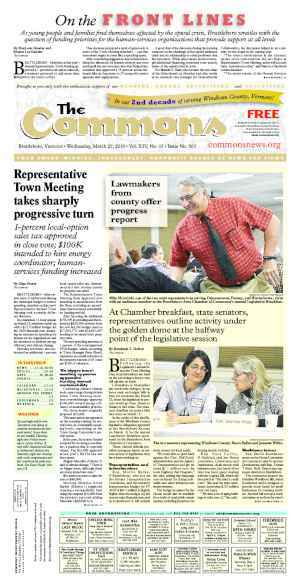 VERNON—In the opening night of Vernon’s Annual Town Meeting on March 6, voters defeated the proposed school budget of $4,079,300 on a 272-222 vote. Vernon School Board chair Mike Hebert explained “our budget is not going up 14 percent. It’s a change in how the state calculates an equalized pupil.” Otherwise, Hebert said, the budget went down by about 6 percent. The budget’s defeat means the School Board will need to revise it and try again, as they need voters to approve a budget before June 30, the end of the fiscal year. Voters made some revisions to the General Fund proposal. But voters didn’t always agree with them. First, Lister Carol Hammond proposed amending the total to $1,932,407.78 to reflect an increase in what Hammond called “a Windham County tax.” This amendment passed. Next, townspeople discussed the Selectboard’s proposal to cut the law-enforcement contract from 20 hours per day to 12 hours per day. 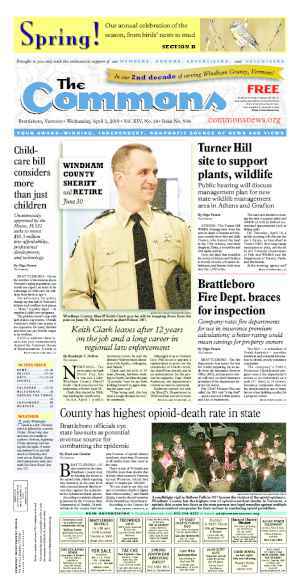 Many residents spoke against the reduction, praising the Windham County Sheriff’s Department’s service to the town, especially for firefighters and EMTs, and elderly residents. Barbara Moseley told a story about a man who called her three nights in a row, trying to scam her out of money. Finally, she called the Sheriff’s Department, and they came to her home to await the alleged scammer’s nightly call. When it came in, the deputy talked to the caller, “and I don’t know what the Sheriff said to him, but he never called again,” Moseley said. Resident Julie Ball proposed an amendment to the law-enforcement line item in the general fund, restoring it to its current coverage, at $232,960 for the year. Martin Langeveld pointed out this will cost $26.67 per Vernon resident for the year. 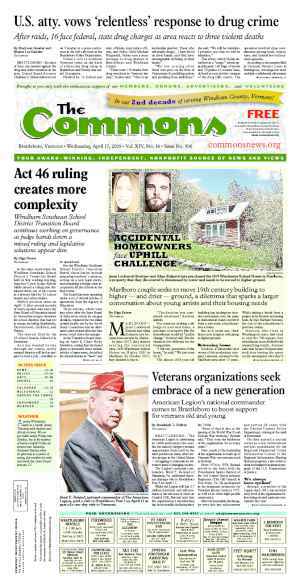 After a voice vote was too close to call, townspeople voted by paper ballot to narrowly approve the Ball amendment in a 104-96 decision. Next, resident Matt Coombs attempted to amend the general-fund budget by removing the town administrator position as well as health and dental insurance for town employees. Coombs said that when the town proposed adding the town administrator position, they promised voters the salary would get covered by grants, and that hasn’t happened. Numerous town officials spoke up in support of keeping the position — and they specifically praised Michelle Pong, who was appointed to the position in June, 2016. Board member Emily Vergobbe listed some of the grants Pong brought to the town so far: $29,000 in secured funds, and $87,000 in pending funding. Vergobbe included “the nonfinancial asset of having a town administrator” in her statement, noting Pong “is a huge asset to the Selectboard.” In a voice vote, townspeople unanimously defeated Coombs’s proposal; even he didn’t vote for it. 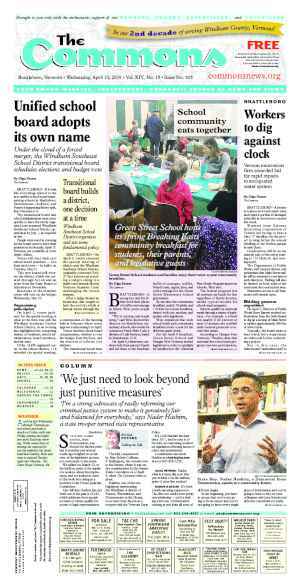 Attempts to amend the general fund budget by adding money to the Planning Commission and restoring the Maintenance Department — which the Selectboard voted to eliminate during budget talks — were both defeated. Mike Hebert honored retiring WSESU Superintendent Ron Stahley with a certificate; voters honored Stahley with a standing ovation. Selectboard member Sandra Harris honored retiring Selectboard Chair Christiane Howe with a bouquet of flowers and a plaque; voters gave Howe a standing ovation. Howe started working for the town in 1982, when she began driving the senior van. Since then, she has held approximately 20 positions in town, both elected and appointed. The rest of the Town Meeting warrant was scheduled to be taken up on March 9. Assistant Library Director Jean Carr can add “Selectboard member” to her resume. Carr won the three-year seat in town elections on March 7, soundly beating Jessica Freeman Earp and Kristina Walker. Jeff Dunklee won his uncontested run for the two-year Selectboard seat. The Selectboard elected Josh Unruh as Chair and Steve Skibniowsky as Clerk at their organizational meeting held immediately after the election results were announced.